A hark back to brewing the way it was 7,000 years ago has seen Moa Brewing Co. take away three awards for its sour beers at the Australian International Beer Awards in Melbourne last night. Moa’s Sour Grapes 2014 Vintage and Cherry Sour 2013 Vintage each scored a silver in the 'Other Belgian/French Style Ale' category to pip offers from Italy to the US and even China. Moa’s Sour Blanc 2012 Vintage was then awarded a bronze in the 'Best Belgian/French Style Ale' section otherwise dominated exclusively by Belgian beers. A further six gongs were tallied up across the evening via variants from the brewery’s diverse range, totaling nine awards across the evening. The AIBA, conducted by The Royal Agricultural Society of Victoria (RASV), is the largest annual beer competition in the world assessing both packaged and draught beer. Sour beers have an intentionally acidic and tart taste to them, made by allowing wild or naturally occurring yeast strains into the brew. The result is most akin to how beer was brewed naturally some 7,000 years ago. “We’ve been working on our sour program for six years now, and we’re really pleased at how the beers have developed over the last few years in particular. With sours being the hot category in the US craft scene right now, it’s fantastic to get some kudos that we’re delivering some world class beers,” says head brewer David Nicholls. New Zealand brewer’s growing reputation for excellence was highlighted by ParrotDog, Epic, Lion and DB picking up trophies, with ParrotDog also picking up the title of Champion Small International Brewery. The full list of winners can be found by clicking here. Moa enjoyed its best ever showing at this year’s annual Brewers’ Guild of New Zealand Beer Awards, picking up a total of 12 awards, including the trophy for the best ‘Cask Conditioned’ beer with Moa Five Hop (Handpull). Now in its eighth year, the 'Brew NZ Awards' is a truly international competition, with entries from throughout New Zealand and the rest of the world. All beer entries are rated against a style guide for each category for its aroma, colour, bitterness, flavour and presentation. A beer’s overall balance of characteristics was judged by a panel comprising 25 national and internationally qualified judges. Moa Brewing Company struck Irish gold with the biggest medal haul of any brewery worldwide at the Dublin Craft Beer Cup held over the weekend. Moa picked up a total of seven medals – one gold, four silvers and two bronze – to beat over 80 other breweries from around the world. The timing could not have been any better with Moa’s first shipment to Ireland only weeks away from hitting the water. “It’s great to see our beers continue to feature at the sharp end of beer competitions all over the world, especially given the likes of Anchor Brewing Company, Oskar Blues Brewing, Flying Dog, Left Hand and other highly regarded American breweries entered beers into these awards”, says Moa Head Brewer, David Nicholls. “We’re also chuffed to have some other New Zealand breweries sharing in the spoils with Schippers Brewing Company picking up three silvers and a bronze, Invercargill Brewery a bronze, and our good friends down the road, Renaissance, also picking up a silver”, added Moa Founder, Josh Scott. Danish brewery Coisbo claimed the highly coveted trophy for best beer with their Russian Imperial Stout. Everyone loves a surprise when you’re celebrating your birthday. And for Kiwi craft brewer Moa, the anniversary has been feted with more international honours for the mantelpiece. For the third year running, Moa has hauled in the most awards of any New Zealand brewery at the fourth annual Asia Beerfest in Singapore. And the icing on the cake? The medals were handed out on June 13, the same day the Marlborough brewery celebrated its 10th anniversary but made official today. The big award went to the Marlborough brewer’s Moa St Josephs beer which, in addition to picking up a Gold, was also judged Best Australasian beer. Moa St Josephs is a classic, very approachable and drinkable Belgian Tripel. Altogether Moa picked up three Golds, one Silver, one Bronze and a Trophy in a field of more than 600 beers contesting the 2013 awards. All entries are blind tasted by a panel of international judges. 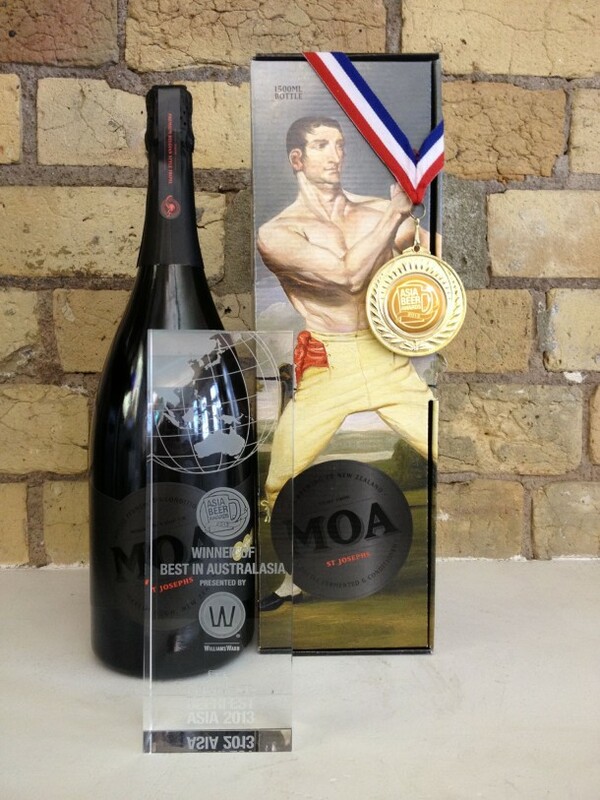 Moa won Gold for its Moa St Josephs, Moa Noir and Weka Apple Cider in the Australasian Cider category. Weka also nabbed a Silver in the International Cider Category while Moa Pale Ale was awarded a Bronze medal. “Asia Beerfest is becoming more and more competitive every year so to maintain our record there and bring home so many medals is fantastic and reinforces the outstanding quality of beers coming out of our brewery. It also proves again how well our beers travel, Singapore being on the equator there is no harder market to maintain beer quality”, says Moa general manager Gareth Hughes. Moa Head Brewer David Nicholls says he’s particularly rapt that Moa Noir has been recognised. Moa Noir is a traditionally brewed, bottle conditioned European-style dark lager with an abundance of distinct aromas and flavours. Weka cider is made from Nelson-grown apples. Fermented with French Oak at cool temperatures to preserve the fruit flavours and crispness on the palate, Weka Apple Cider has a typical green apple aroma and the clean refreshing taste is finished nicely with medium sweetness. The Asia Beerfest this year was a bit of a prize-fest for Kiwi breweries, Hughes says with McCashins Brewery picking up Gold medals for their Stoke Lager, Stoke Pilsner and Bohemian Ale, and two Bronze medals for their 2 Stoke and Rochdale Apple Cider, and Tuatara picked up a Bronze for their Tuatara Pilsner. Since 2011 Moa has won 17 Gold, 17 Silver and 27 Bronze medals in international and national beer festivals. New Zealand craft beer brewers have enhanced their international reputation for excellence with another big showing at the Australian International Beer Awards. Kiwi beers took home a total of 65 awards including six trophies and seven gold medals. Marlborough craft brewer Moa won with their Special Reserve range and took away six awards including Gold in the Belgian Lambic style with their Moa Sour Blanc. The awards had a record number of entries with 1490 different beers entered from brewers spanning 35 countries. “New Zealand entries were up 37% at the Aussie awards this year and that just goes to show how strong the local craft brewing industry is. It’s awesome to see so many Kiwi brews doing so well on the international stage,” says Moa executive brewer Josh Scott. The local brewing industry was also recognised with Brain Watson (Contract Brewing), Doug Donelan (NZ Hops), Luke Nicholas (Epic Beer), Ralph Bungard (Three Boys Brewery), Richard Emerson (Emersons Brewery), Shane Morley (Steam Brewing) all serving as judges. Yvette Corlett (nee Williams) long jumped to Olympic gold there back in 1952 and now Marlborough brewer Moa has leaped to glory with its Methode Pilsner. No actual jumping or Olympic medals were involved for the Moa Methode Pilsner. But it did hit the tape in front of 65 rival beers to win gold in its category at the Helsinki Beer Awards during the weekend. “We’re pretty happy with our Methode. She prepared well and even though she was 17,000 km from home, she still dominated against a pretty big field,” says Moa founder and executive brewer Josh Scott. Moa Methode Pilsner won the “Pale Lager Does Not Exceed 6%” category. Finnish brews Rooster Beer Cellar from Laitilan Beverages and Kaiser Lager from Nokia’s Brewery took second and third places respectively. The Helsinki Beer Festival drew more than 300 different beers from around the world and Moa showcased its Pale Ale, Methode, Noir, Imperial Stout and Breakfast varieties. It’s not the first gold for Moa Methode, which scooped the Asia Beer Awards in 2011 and received bronze then silver medals in subsequent Australian International Beer Awards. The award becomes the 40th medal for the Moa Brewing Company as it heads into its 10th year of business.